If there&apos;s somewhere to experience a full out cultural shell shocking, the night markets are the place to go. You will be picked up at 06:30 pm from your hotel and transferred you to the Night Food Market near the City God Temple. There are plenty of vendors offering a selection of snacks that you might haven&apos;t seen before: Roasted Mutton Cubes on spit, Garlic fans steamed scallop in shell, Fried bean curd and beef with cayenne pepper, Spicy Crayfish and more. Actually, most street foods have been renovated due to sanity and noise issue. The most popular snack street in the city – the renovated Wujiang Road is your next stop. 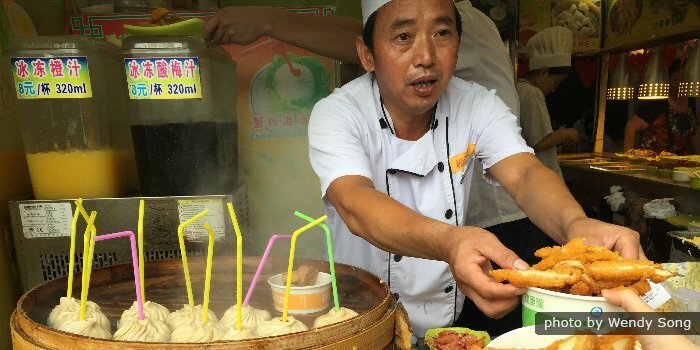 Many old restaurants along this road are famous for authentic and delicious Shanghai snacks such as fried buns, wonton, soup dumplings, crab shell pie and more. There are western-style restaurants too, providing you with many food choices. Take dinner at a restaurant that you prefer and return to your hotel afterwards. Your guide will contact you on the evening before your tour and confirm the exact pick-up time according to your preference. For most city-day tours in Shanghai, Hangzhou or Suzhou, you will stop at a shop, but there is absolutely no forced shopping. An extra fee applies if you need to be picked up or dropped off from/to airports or cruise terminals earlier than 07:00 am or later than 21:30pm.